3 Bedroom House For Sale in Shaftesbury for Guide Price £400,000. 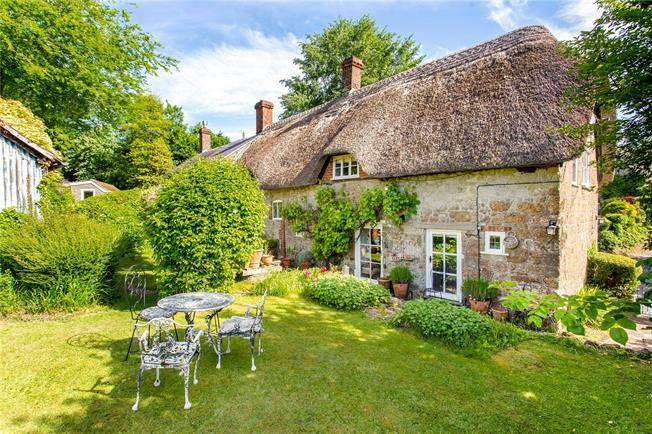 A glorious, quintessential character cottage pleasantly situated in the beautiful village of Compton Abbas. This three bedroom home has been beautifully refurbished and maintained by the current vendors. Attention to detail is evident in every room, with many of the original features still evident throughout. The deceptively spacious cottage is accessed from the rear entrance. A hallway then leads to the kitchen/breakfast room, sitting room and cloakroom. The kitchen has been beautifully appointed and carefully designed ensuring the there is ample storage space as well as integrated appliances. There is space for a breakfast table. The sitting room beyond is a wonderful size with a glorious inglenook fireplace. On the first floor there are three generous bedrooms serviced by a well-appointed family bathroom. The home offers wonderful scope for further development or expansion. There is a further outbuilding that is available at separate request. Corner Thatch is situated in the picturesque village of Compton Abbas, located on the edge of the truly stunning Blackmore Vale. The beautiful surrounding countryside is some of the best in the south of England and is ideal for enjoying outdoor pursuits such as walking, cycling and riding. The village itself has a great community spirit and a village church. The Saxon hilltop town of Shaftesbury is around 3 miles north of Compton Abbas and has a wide range of amenities including a range of shops, a delicatessen, supermarkets, a health centre, local hospital, library and arts centre. A more comprehensive range of facilities may be found in the Cathedral City of Salisbury to the east, while nearby Tisbury has a mainline railway station (London Waterloo). The A303, approximately 15 minutes to the north, gives access to the South West and London, via the M3. One of the major attractions is the proximity to some of the best independent schools in Southern England including Bryanston, Clayesmore, Hanford, Knighton House, Leweston, Millfield, Milton Abbey, Port Regis, Sandroyd, Sherborne Boys, Sherborne Girls and St Mary’s Shaftesbury, to name few. The home occupies a wonderful elevated position in the heart of this much sought after village. There is a parking space in front of the recessed oversize single garage. The garden is found to the rear and is a wonderful size offering stunning views across the village to the hills beyond. The garden is designed with ease of maintenance in mind and is predominantly laid to lawn and interspersed with some herbaceous beds and borders. The 'Piggery' is found behind the home and is available at separate negotiation, but offers scope for development or refurbishment.